HA NOI (VNS) — With funding needs rising commensurately with the rapid growth of Viet Nam's aviation industry, there is an opportunity for private sector participation in developing air infrastructure. The Civil Aviation Authority of Viet Nam (CAAV) has estimated that more than VND230.2 trillion (US$10.2 billion) would be needed for investment in airport infrastructure in 2015-20. "Investments in infrastructure and human capital at airports are not keeping pace with the growth in the aviation industry across ASEAN nations, except perhaps for Singapore," Neil Bentley, vice president, aviation, Asia Pacific, AECOM, told Viet Nam News. Many countries have the necessary plans and programmes, but seem to be struggling with an effective and timely rollout and implementation of these plans, according to the vice president. Until this is adequately addressed, air travellers could experience increased congestion and delays. The Vietnamese aviation sector is expected to speed up in the next five years after the ASEAN Single Aviation Market takes effect early in 2016. Many of the ASEAN members have experienced significant growth since 2005, and much of this is due to the deregulation of the airline industry allowing for the entry of low-cost carriers, as well as buoyant economic conditions over the last 10 years. According to the International Air Transport Association (IATA), Viet Nam was the third fastest growing aviation market in the world in 2001-14, with average growth of 14.5 per cent in passenger traffic and 15.3 per cent in freight. Viet Nam has four airlines – Vietnam Airlines, low-cost carriers Jetstar Pacific Airlines and Vietjet, and Vietnam Air Service Co – with a fleet of over 110 aircraft flying on more than 100 international and domestic routes. The fleet is expected to increase to 205 by 2020. However, infrastructure is a critical hindrance to the expansion of the country's air transport sector, to overcome which requires co-operation between the Government and businesses. Over the last two years the two international airports, Noi Bai in Ha Noi and Tan Son Nhat in HCM City, have been very congested. The overcrowding has reduced this year after the renovation of the domestic passenger terminal at Tan Son Nhat and the opening of T2, the new international passenger terminal, at Noi Bai. 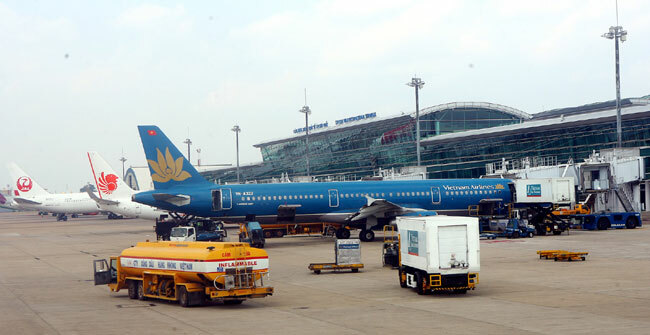 "With the current annual growth rate of 14-16 per cent, airports will likely continue to experience congestion in the next three years when airports must operate beyond their capacity, especially Tan Son Nhat and Da Nang," Bui Minh Dang, deputy head of the Civil Aviation Authority of Viet Nam's transport division, said. Further expansion of the nation's busiest airport, Tan Son Nhat, is ruled out as there is no more land available and roads heading to the airport are too crowded. The Government is pushing for the construction of the Long Thanh International Airport in neighbouring Dong Nai Province to improve things. The new airport, which is projected to become operational in 2020, can serve over 100 million passengers and handle five million tonnes of freight annually when it reaches its maximum designed capacity by 2050. The cost of the project is estimated at a massive VND336.63 trillion ($15 billion), with the first phase costing around VND114.45 trillion ($5.1 billion). In all, two new airports, Long Thanh and Van Don, are planned together with the expansion of Noi Bai, Da Nang, and Cam Ranh airports and renovation of domestic terminals elsewhere. Viet Nam is expected to handle 106 million passengers by 2020 and 200 million passengers by 2030. The investment needed for airport infrastructure is huge but public funds and government bonds are expected to meet only around 13 per cent of the need while private investors could fund around 60 per cent of it. In this context, Truong Van Phuoc, vice chairman of the National Financial Supervisory Commission, said public-private partnerships (PPP) are a suitable solution to raise vital funds and reduce pressure on the Government to provide funds. "I support the sale or concession to private businesses," Phuoc told media at a meeting held to raise public funds to develop airport infrastructure in April. "The problem is what to sell, how to sell and sell for how much." Earlier this year Vietjet, Vietnam Airlines and some private businesses asked to buy the operational rights to Noi Bai Airport's domestic terminal T1. T&T Group, VinGroup and Sungroup are eyeing Phu Quoc Airport. Cam Ranh, Van Don and Phan Thiet airports are also attracting interest among domestic investors. The Aviation Airport Corporation of Vietnam (ACV), a wholly State-owned company, manages all 22 airports in the country that had a total capacity of 58 million passengers as of March. The Ministry of Transport unveiled plans last December to solicit private investment in aviation infrastructure under which private investors will be allowed to invest in services, management, concession, BOT (build-operate-transfer). Airports could also be sold to strategic investors. "Airlines are the main users of infrastructure at airports and so I hope the policy of granting airport concessions to businesses will be put in place," Vietjet CEO Luu Duc Khanh said. However, though private investors are excited about the opportunities to enter aviation infrastructure, the plan remains on paper and the legal framework needed for this kind of investment has not been developed. According to experts, the Government should be careful in planning and industry insider consultation to create an efficient legal framework before contemplating any changes to the current structure and ownership of airports. Airline ownership of airports is not a common feature in ASEAN member countries. The common model is that airlines are airports' customers and the airports are responsible for providing the infrastructure. Airlines do not invest in airport infrastructure except for some looking to develop dedicated facilities. In addition to the risk of monopoly if airlines own airports, Lai Xuan Thanh, director of the Civil Aviation Authority of Viet Nam, said some caution was also necessary because airport infrastructure was related to a nation's security.